Background – The San Marino Motor Classic had its first show in June 2011. San Marino Rotary Charities received a distribution of $25,000 from that Motor Classic. These funds more than doubled the resources available for unrestricted charitable work in the community. This set Rotary Charities on a new course of community activism and support. The second Motor Classic was held in June 2012; it was more successful and the distributions to its charitable beneficiaries increased. Rotary Charities received $62,500, which again significantly increased the resources available for community support and projects. These funds were received in late June 2012 and, given the timing, were used in the 2012-13 Rotary year. Unrestricted charitable funds for 2012-13 totaled approximately $91,000, of which $62,500 came from the Motor Classic, $16,000 from Rotary members (largely through the purchase of Motor Classic tickets), and $12,500 from other contributions and grants. The Rotary Charities and Club boards wanted to wisely and fairly use the funds to support community organizations. Both boards wanted our distributions, to some degree, to recognize that 2013 was the Centennial Year of the founding of the City of San Marino, and they wanted Rotary to be a significant part of that celebration. 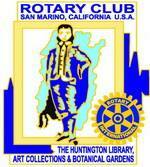 *See a separate paper on Rotary’s involvement in the Red Car Mural Project. Rotary Centennial Field – Rotary historically has had a long tradition of supporting youth activities, and the Rotary board wanted to participate strongly in a youth-orientated project in the Centennial Year. The question was: What project? By coincidence, at that time Rotarian Dennis Kneier’s son-in-law, Matt Hill, was visiting in San Marino. Matt was a star soccer player at Columbia University and then held an executive position at Major League Soccer in New York. He asked what the City had to offer in terms of youth sports fields. Sadly, the answer was ‘none,’ other than a small patch of grass at the Stoneman Recreation Center. Matt suggested that an enlarged field at Stoneman be considered. Such a field could be used for youth soccer, flag football, baseball, and general youth p lay in connection with the City’s recreation programs. The idea of a sports field was presented to the Rotary board, the City Manager, Recreation Director and others, including representatives from the regional AYSO. All parties were quite enthusiastic about the idea, providing there was adequate funding for the project. A committee of Rotarians, working with the City Manager, made inquiries on how to get such a field developed. A couple of landscape development companies gave preliminary estimates, but they were in the $40-50,000 range, an undertaking that would be beyond our resources. The San Marino Tribune printed an article on what Rotary was trying to do, and luckily, a resident who owned a company that specialized in field development came forward. He suggested that, with a discount he would offer and if the City could do the irrigation work, the project possibly could be done for about $20,000. Rotary reached an agreement with the City that its employees could do asphalt demolition, irrigation and possibly some other tasks. Detailed plans were drawn, a contract entered into with the landscape company and, to make a long story short, all aspects of the field development proceeded quite quickly. The goal was to have the field completed in the late spring of 2013 to coincide with the Centennial Celebration. The cost, including protective fencing, a plaque, etc., came to $22,000. The project’s timing goal was met, and Rotary had one of its weekly meetings at the Stoneman Recreation Center for the formal dedication of the field. The dedication event was attended by a strong contingent from Rotary and their families, the City Council, City employees, the press and community members. To this day the field bears a plaque “Rotary Centennial Field” and is used for a multitude of youth recreation activities.